Our Log Home Show Team Travels Off to the Midwest! Home|Blog|Uncategorized|Our Log Home Show Team Travels Off to the Midwest! Next up on our busy travel schedule are the shows in Kansas City Mo., Atlanta and Indianapolis. These are three shows that serve areas where plenty of log homes fit comfortably in nearby locations. If you’re new to log homes, these shows are a great way to become better informed about Katahdin’s dedication to quality, efficiency and great design. 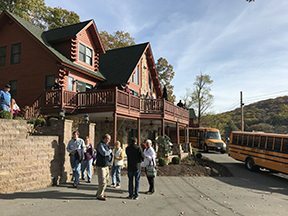 A visit to our beautiful Katahdin booth gives you a chance to learn more about what makes our approach unique, including our commitment to energy efficiency and complete custom designed log home packages.